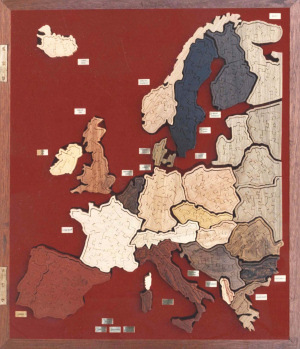 Since Peter started making the puzzles, he has worked in nearly two hundred different woods, both English and foreign. The English ones have included Yew, Walnut, Box, Oak, Holly, Sycamore, Lacewood (Plane cut in a particular way), Pear, Cherry and Acacia. In the Seventies, it was possible to get almost any exotic hardwood from abroad. Peter has, over the years, used eighteen different rosewoods, including the beautifully grained ones from Brazil, like 'Rio', Kingwood, Tulipwood (no relation to the Tulip Tree) and Coco-Bolo. 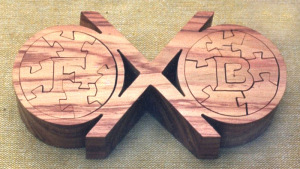 He has also made puzzles from eight different varieties of Ebony. In recent years, the long overdue measures taken to prevent the destruction of the world's rain forests have meant that many woods have become almost unobtainable and those that Peter can get hold of quite often come in such small dimensions that he can only make the slimmer of his puzzles out of them. The implications of these two factors are that the choice of woods from which Peter can make your puzzle depends not only upon their availability at the time but also upon the size of the puzzle. All the woods used by Puzzleplex are imported from sustainable sources. See the three-dimensional puzzle price list.